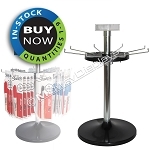 Floor and Counter Top Hook Displays to Buy Now. 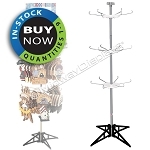 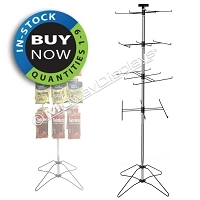 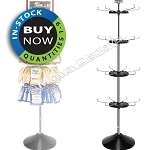 Our best selling in-stock Hook & Rotor Displays ship quick in small quantities. 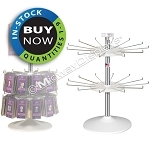 Select from our best selling styles of plastic & metal hook and rotor displays that will maximize your merchandising options by quickly and economically presenting your packaged or un-packaged products! 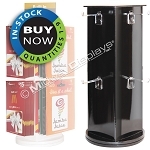 You are sure to find a display to fit your product's size and capacity needs from this in-stock floor and counter top collection. 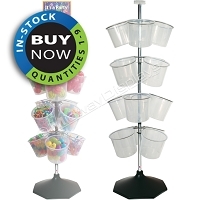 The adjustable rotors with various hook options provide the most economical spinner display stand for your candy and salty snacks. 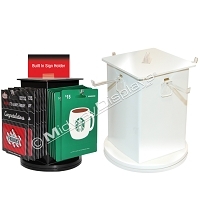 These display fixtures all include a sign holder for your header sign to speak your branding message. 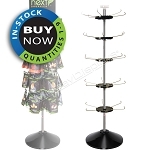 All these IN-Stock | BUY-Now Merchandisers are available for immediate Purchase to ship quick in small quantities.